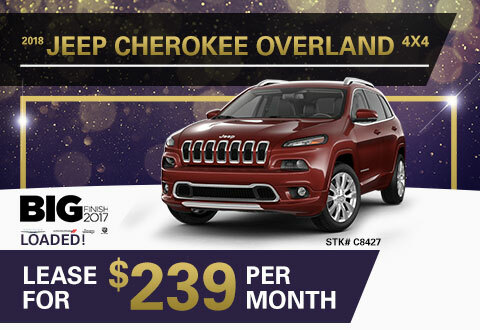 At Oxmoor Chrysler Dodge Jeep Ram, you’ll find a huge selection of competitively priced new inventory to choose from, as well as the new vehicle specials to match. 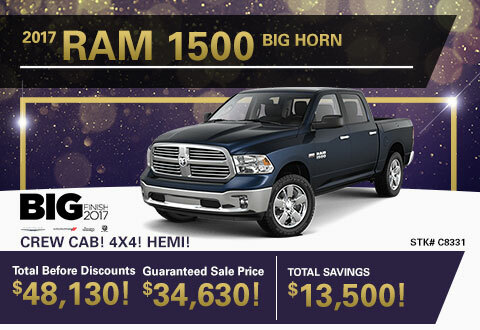 From the new Chrysler 300 sedans and new Dodge Journey SUVs, to the new Ram 1500 trucks and new Jeep Wrangler SUVs, we have the new models you love at prices you can afford. You can also explore our new car incentives to learn about current finance offers and cash incentives. To explore our current automotive specials, browse our new car discounts below. 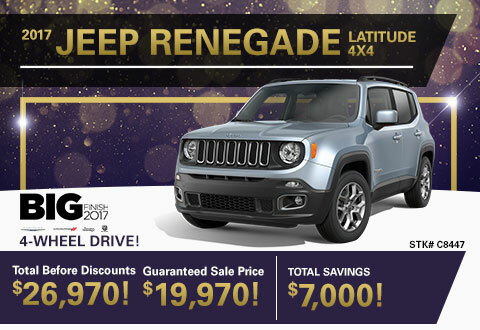 On select in-stock new 2017 Chrysler Dodge Jeep RAM models. $0 due at signing. Excludes tax, tag, title and registration fees. 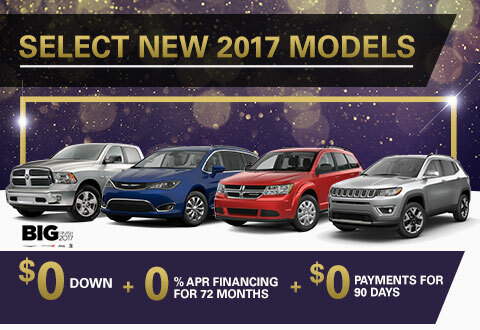 0% APR financing for up to 72 months with monthly payment of $13.89 per $1,000 borrowed. For well-qualified applicants only, with approved credit. 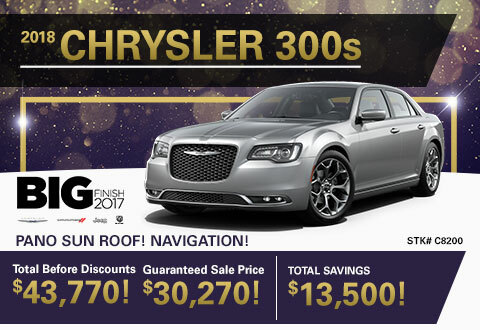 Must receive financing through Chrysler Capital. No down payment required. Other rates and payment terms available. Cannot be combined with any other incentive. Length of contract is limited. Subject to credit approval, vehicle insurance approval and vehicle availability. See dealer for complete details. Expires 01/02/18. Stk# C8331, MSRP $48,130. 24-month lease. 10,000 miles/year. $3,000 due at signing, with approved credit through US Bank, plus tax, tag, and license and 1st month’s payment of $199 due at delivery. Offers are mutually exclusive and cannot be combined. See dealer for complete details. Offer expires 01/02/18. Stk# C8200, MSRP $43,770. $3,000 due at signing, with approved credit through US Bank, plus tax, tag, and license due at delivery. Offers are mutually exclusive and cannot be combined. Discounts in the form of cash rebates and dealer savings. See dealer for complete details. Offer expires 01/02/18. Stk# C8447, MSRP $26,970. $3,000 due at signing, with approved credit through US Bank, plus tax, tag, and license due at delivery. Offers are mutually exclusive and cannot be combined. See dealer for complete details. Offer expires 01/02/18. Stk# C8438, MSRP $44,75. 36-month lease. 10,000 miles/year. $3,000 due at signing, with approved credit through US Bank, plus tax, tag, and license and 1st month’s payment of $399 due at delivery. Offers are mutually exclusive and cannot be combined. See dealer for complete details. Offer expires 01/02/18. Stk# C8438, MSRP $44,75. 27-month lease. 10,000 miles/year. $3,000 due at signing, with approved credit through US Bank, plus tax, tag, and license and 1st month’s payment of $239 due at delivery. Offers are mutually exclusive and cannot be combined. See dealer for complete details. Offer expires 01/02/18. If you’re looking for new vehicle deals in Louisville, Kentucky, you’ll discover incredible deals on new cars right here at Oxmoor Chrysler Dodge Jeep Ram. Explore our special rebate programs and military discounts to save more on your dream model. Interested in finding a low-priced used vehicle? Our used car inventory has something for every kind of budget. To get the ball rolling on a used or new car right away, fill out our online auto financing application now. One of the easiest ways to experience additional savings on top of one of our exclusive new car coupons is to value your trade. If your current vehicle is on its way out, you can work with our finance department to turn it into extra savings on one of our reliable used or new cars. 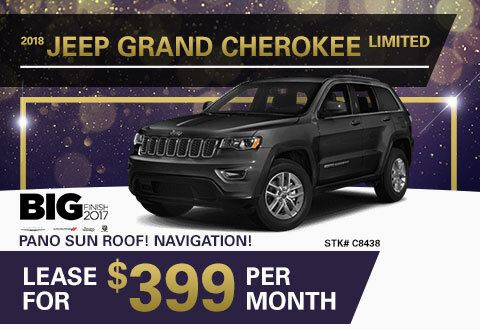 To learn more, and to get on board with our amazing dealership specials, contact Oxmoor CDJR now.